Otis Lee Clay (February 11, 1942 – January 8, 2016) was an American R&B and soul singer, who started in gospel music. In 2013, Clay was inducted to the Blues Hall of Fame. Clay was born in Waxhaw, Mississippi to a musical family, who moved in 1953 to Muncie, Indiana. After singing with local gospel group, the Voices of Hope, he returned to Mississippi to sing with the Christian Travelers, before settling in Chicago in 1957. There, he joined a series of gospel vocal groups including the Golden Jubilaires, the Famous Blue Jay Singers, the Holy Wonders, and the Pilgrim Harmonizers, before making his first solo secular recordings in 1962. They were unissued, and Clay joined the Gospel Songbirds, who recorded in Nashville in 1964 and who also included Maurice Dollison who sang R&B under the name Cash McCall, and then the Sensational Nightingales. In 1965 Clay signed with One-derful! Records in Chicago, to make secular recordings. 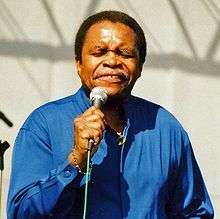 After releasing a series of gospel-tinged soul records, his first hit came in 1967 with "That's How It Is (When You're In Love)", which reached # 34 on the US Billboard R&B chart, followed by "A Lasting Love" (# 48 R&B). In 1968 the record company folded and his contract was bought by Atlantic Records, who launched their subsidiary Cotillion label with Clay's version of the Sir Douglas Quintet hit, "She's About A Mover", produced at the FAME Studios in Muscle Shoals. The record became Clay's biggest pop hit, reaching # 97 on the Billboard Hot 100 (# 47 R&B). However, follow-ups on Cotillion, including "Hard Working Woman" produced by Syl Johnson, and "Is It Over?" produced by Willie Mitchell in Memphis, were less successful. Clay moved to Mitchell's Hi Records in 1971, and made many of his best known soul blues records for the label. His biggest hit came in late 1972 with "Trying To Live My Life Without You," a #102 hit on the Billboard Hot 100, #70 on Cash Box, and #24 R&B, which he followed up with "If I Could Reach Out". "Tryin' To Live My Life Without You" was later covered by Bob Seger, whose version hit #5 on the pop chart in 1981. After several more Hi singles and the album I Can't Take It, Clay moved to Kayvette Records, where he had his last national hit single in 1977, "All Because Of Your Love" (#44 R&B). He later recorded for the Elka and Rounder labels, as well as his own Echo Records for whom he recorded the original version of "The Only Way Is Up" in 1980. He remained a popular live act in Europe and Japan, as well as the US, and recorded three live albums, Soul Man: Live in Japan, Otis Clay Live (also in Japan on Victor VDP-5111), and Respect Yourself, recorded live at the Lucerne Blues Festival in Switzerland. In the 1990s he also recorded two soul albums for Bullseye Blues: I'll Treat You Right and the Willie Mitchell-produced This Time Around. In 2007, he recorded the gospel album Walk a Mile in My Shoes. He was a nominee for a Grammy for Best Traditional R&B Vocal Performance. As a resident of Chicago's West Side, he was actively involved in community-based economic and cultural initiatives, including the development of The Harold Washington Cultural Center. On August 11, 2012 he was one of several acts that performed at Lincoln Center Out of Doors Summer Concerts in New York City. He was backed by the band Platinum. Clay was joined on stage for the finale by William Bell and Teenie Hodges. Clay was one of the 2013 inductees to the Blues Hall of Fame. In 2015 Otis published with Billy Price the album This Time For Real. During 2015 Otis Clay and Johnny Rawls won the Blues Blast Award for Soul Album of the Year for their album "Soul Brothers". "Soul Brothers" was also nominated for Blues Music Awards Soul Album of the Year and Living Blues Magazine Blues Album of the Year. It was selected as the #6 Blues Album of the Year in the Downbeat Magazine Critics’ Poll, being the only soul album on the list of top 20 albums. On January 8, 2016, Clay died in Chicago, Illinois, at the age of 73 of a heart attack. Clay's funeral was held on January 16, 2016 at the Liberty Baptist Church in Chicago. After the funeral, he was buried at the Oak Woods Cemetery in Chicago. 1980: "The Only Way Is Up"
^ Eagle, Bob; LeBlanc, Eric S. (2013). Blues - A Regional Experience. Santa Barbara: Praeger Publishers. p. 204. ISBN 978-0313344237. ^ a b "2013 Blues Hall of Fame Inductees Announced". Blues.org. Retrieved 2013-03-06. ^ "Otis Clay, Soul and R&B Singer, Dies at 73". The New York Times. The Associated Press. 11 January 2016. Retrieved 12 January 2016. ^ a b c d "Blind Pig Records". Blind Pig Records. 1942-02-11. Retrieved 2016-01-09. ^ a b c "Biography". Otis Clay. 1942-02-11. Retrieved 2016-01-19. ^ a b c Whitburn, Joel (2004). Top R&B/Hip-Hop Singles: 1942-2004. Record Research. p. 83. ^ a b Biography by Bill Dahl (1942-02-11). "Otis Clay | Biography & History". AllMusic. Retrieved 2016-01-09. ^ "Otis Clay - The Only Way Is Up / Special Kind Of Love (Vinyl) at Discogs". Discogs.com. Retrieved 2014-03-20. ^ Mervis, Scott. "Soul legend Otis Clay dies at 73". Post-gazette.com. Retrieved 2016-01-09. ^ "Funeral for Otis Clay". Chicago Tribune. Retrieved 2016-01-19. ^ "Otis Clay". Soulbluesmusic.com. 1942-02-11. Retrieved 2016-01-19. This page is based on the Wikipedia article Otis Clay; it is used under the Creative Commons Attribution-ShareAlike 3.0 Unported License (CC-BY-SA). You may redistribute it, verbatim or modified, providing that you comply with the terms of the CC-BY-SA.